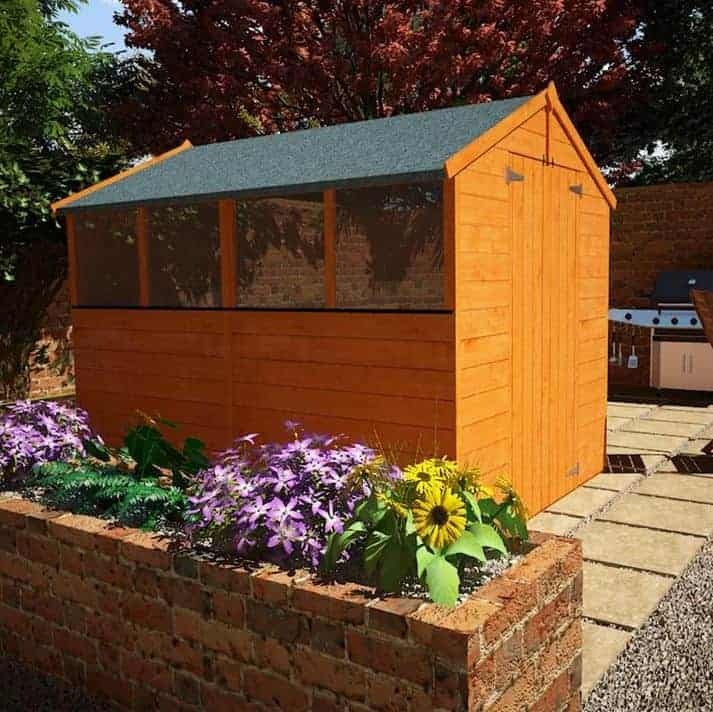 Standing at 8x6ft, at first glance this is an impressive shed that will provide a fantastic storage solution for gardening enthusiasts and families alike. With large double doors and multiple window, this shed has the potential to house all of your outdoor and garden equipment for many years to come. 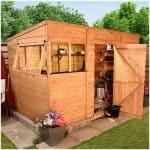 An excellent shed for garden enthusiasts who have large storage requirements. 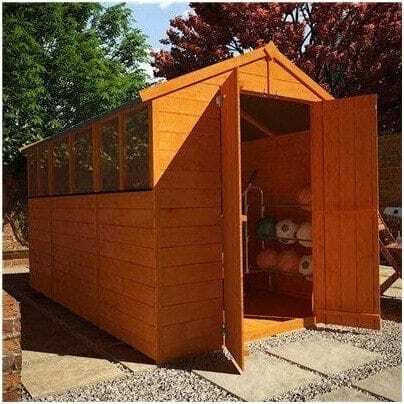 This handsome wooden shed has strong tongue & durable and groove cladding and wide double door space suitable for the user to move large pieces back and forward without issue. There are plenty of windows allow you to see outside and gives the shed a bright and airy feel, and the spacious interior is large enough to be used as an area to relax after a hard day gardening. 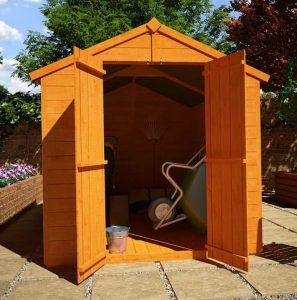 This is a very popular shed and ideal for mid-sized spaces. 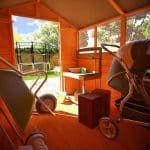 It is weatherproof and built to last – a superb all round garden shed. 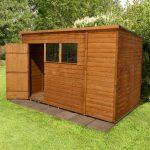 Whether you use the fantastic 8x6ft interior space for straight forward storage of your garden and outdoor items or use it as a place to concentrate on your latest gardening projects, with the many options available to you, you can design this shed to meet your requirements. 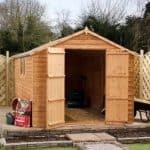 When looking for a brand new shed for your garden you may have many questions about a model’s particular features or how it could fit into your lifestyle. The team at whatshed.co.uk take time to examine, identify and discuss a shed’s features so that you can make an informed decision about your upcoming shed purchase and be confident in the knowledge that you have chosen the right shed for your needs. Exterior: The Billyoh Lincoln 4000 has a tough exterior due to a combination of high quality thick timber, tongue and groove boards and additional framing to keep the structure as rigid and strong as possible. The warm toned timber provides an aesthetically pleasing look to the shed and the multiple windows and large doors make it seem so much more than a standard shed. Interior: The 8x6ft interior floor area is a superb space in which to store your outdoor and garden equipment. From garden furniture to tools, store it all in one place, keeping your garden neat and tidy at all times. Further storage space could be created with shelving, hooks or freestanding storage. Increased headroom provides further opportunity for vertical storage and is an excellent design feature for those taller individuals worried about height issues with a low ceiling. Windows & Doors: With six good sized windows along one side of the shed, you can be confident that the interior will fill with light during the daytime hours. The large double doors provide easy access in and out for those larger or awkwardly shaped items such as lawnmowers or bicycles. Security: No security fittings come as standard with the Billyoh Lincoln, however a simple security fitting such as a padlock can be purchased separately at a modest price and easily attached to the double doors. 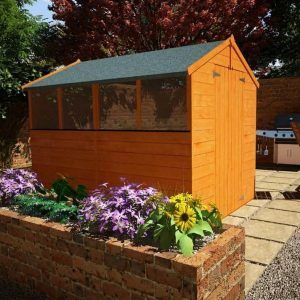 The Billyoh Lincoln 4000 Popular Tongue and Groove Double Door Apex Garden Shed: How easy to build? Billyoh recommend that two people work together to build the Lincoln shed mainly due to the size and height of the structure but most importantly for your own personal safety. Billyoh do what they can to make assembly as easy as possible by ensuring that parts are supplied in smaller, easier-to-manage pieces. Your package will contain all the parts, glazing, fixtures and fittings required for assembly and all that you will need to provide is a basic tool kit. We expect that the Billyoh Lincoln could be built within a day by following the instructions and working together as a team. 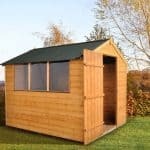 The Billyoh Lincoln 4000 Popular Tongue and Groove Double Door Apex Garden Shed: What is the overall quality like? 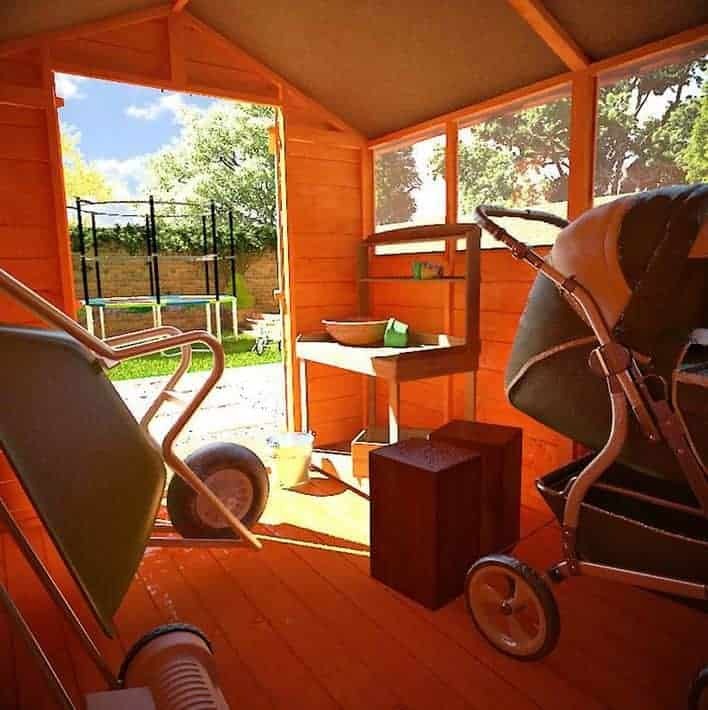 Billyoh have the knack for designing useful garden buildings that are designed with a purpose to have a positive and practical impact on their customer’s lives. With new construction measures in place to make their current range of sheds stronger and better than ever, including thick cladding, additional framing and improved strength and rigidity, Billyoh have an onwards and upwards attitude to their product range. With a range of options available to you throughout the purchase process, from flooring to shelving, why not take this opportunity to build a shed that will truly match your lifestyle and storage needs. As wooden sheds go, the Billyoh Lincoln requires minimal maintenance aside from a finishing treatment once in a while to aid the longevity of the timber and structure itself. In case of your shed becoming dirty, either through seasonal effects or simply general usage, simply hose down with water. At this fantastic price the Billyoh Lincoln 4000 shed has features galore to create the perfect gardener’s haven or storage solution for your garden. Its warm toned timber will blend into the natural surroundings of your garden effortlessly. Ideal for medium sized spaces and gardens, the 8x6ft floor area will no doubt be adequate space for an average sized family, particularly with all of the opportunities to add additional storage as mentioned above. I have to say I am well pleased with the size. I don’t see it as a con at all. I am an avid gardener, i’m out there everyday and I have no issue with my supplies which are ample being in the shed. When a shed is too small, people tend to leave certain things they use everyday out there. But, in this case you don’t have to do that. I would say for any equipment larger than a lawnmower and shovel equipment you certainly should have a larger size but for the money this is perfect. The windows give it character but get help assembling. Perfect in every way. This baby is a gardeners paradise. There is room to be tidy and stack things on the sides and also have enough room for larger objects. Done right, there is enough room to go in and out all day and not feel inconvenienced. The price is splendid and it will last to pay for itself no worries there.